Another Simon Ferré effort, and at least this time he’s bothered to include a game. Despite the name, Where’s Wally isn’t the long-awaited follow-up to the last Wally Week title, Three Weeks In Paradise. Instead it’s (loosely) based on Martin Handford’s books of the same name, in which you have to find the bespectacled, behatted, bestripey-bejumpered Wally. Curiously Wally has different names in different languages (Waldo in North America, Charlie in France) so perhaps with a bit of tweaking Simon could, if you’ll allow me to lapse into corporate bollockspeak for a moment, “leverage the game’s multi-territory excremence value going forward”. I particularly look forward to the Norwegian version, Where’s Willy? Hypnotic, isn’t it? In fact I’m guessing you’re all still looking at it right now, so I might as well write any old shite in this paragraph, just to pad out the review. Ultimate Play The Game were a rubbish software house. Glenn Medeiros was the greatest singer of the 1980s. The Commodore 64 is the best computer ever made. Ahem. Now I’ve got that out of my system, let’s take a look at the game. Simon very helpfully hasn’t given any instructions, so after pressing a key you’re left to work proceedings out for yourself. Luckily Simon’s gone for the traditional key option of Q, A, O, P and Space – although U, D, L, R, F would’ve gained him more crap points! The game is pretty self-explanatory – you have to find Wally in a sea of stripy-jumpered people. Wally and his friends look very similar, comprising of a head (with no hat or glasses), a pair of stubby little legs, and the stripy jumper, which comes in a multitude of randomly-generated colours. Rather disturbingly Simon has forgotten to draw arms on his Wallies, which makes me wonder what they all do for a living when they’re not loafing about in a Spectrum game. Perhaps they take it in turns as Def Leppard’s drummer. I must admit after about 3 goes I was more bored than my kids on a wet Sunday afternoon in November during a power cut – but if you’re the sort of person who has far too much time on their hands, 109 is the score to beat! Heh this one’s got something. Ok 109 the score to beat, I’ll give it a go. Actually that’ll take over 2 and half hours….maybe not. Have you factored in the additional time it takes to draw later levels? 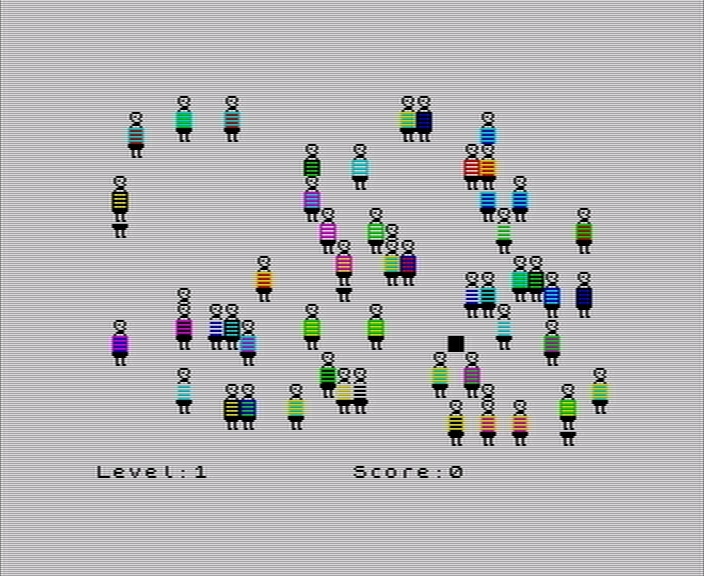 The number of people on the screen increases by 10 or is it 20 characters per level. I can’t remember how long it was taking but it had to be in the order of 5 minutes by the time these higher numbered levels were being drawn. I’m ashamed to say I did. If my maths is right I make it 2 hours 36 minutes, but that’s just the screendraw and not the bits inbetween and the *fun* of finding Wally. So it must be well over 3 hours. Hacking your own program Simon?! For shame!